The jazz quintet has several classic line-ups - added to the rhythm section of piano, bass and drums, the two horns most used have been trombone and tenor sax or trombone and trumpet. Quince Jam continues this tradition, which include the bands of trombonist J. J. Johnson and tenor saxist Bobby Jaspar, and J. J. Johnson and trumpeter Nat Adderley. Another wonderful group was that of valve-trombonist Bob Brookmeyer and trumpet and flugel horn player Clark Terry. Quince Jam play songs associated with these groups, many of which are from the Great American Songbook by composers such as George Gershwin, Jerome Kern, Cole Porter, and Harold Arlen. Jazz standards like ’Walkin’’, ‘Blue Monk’ and ‘Billie’s Bounce’ also feature, as do wonderful old songs from the 1920s and '30s like 'Struttin' With Some Barbecue" and "Lousiana". Don's partners have included Chris Genoux and Ron Romero on tenor sax, Leesa Snider on alto sax, and Brae Grimes and Jessica Carlton on trumpet, together with excellent rhythm sections like that with the piano, bass and drums of Jacob Bowker, Daniel Beinke and Ben Teniswood. Guitarist Tim Willis has also substituted for piano on some gigs, and we've played some of his tunes. As time has passed, the band has become more flexible in its approach and added tunes by Michael Jackson, Lionel Ritchie, Sade, Norah Jones, Amy Winehouse and Ben E. King, sung by Maryanne Smart and Samantha Frazer. 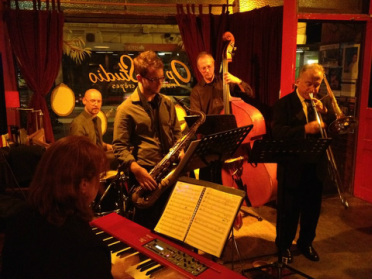 Our music suits clubs and (quiet) pubs, festivals, parties and any celebratory occasion to do with jazz lovers.